This is the most complete circuit of the famous W, and a panoramic view of the mountains most important of Torres del Paine, with a physical requirement not very high, is recommended for all kinds of people willing to walk in the mountains, you can see the towers, the French valley and glacier gray lookout and navigation in front of the glacier, always surrounded by an incredible flora and fauna that accompany us in our day hike. Day 1 Our guide will meet you at the airport in Puerto Natales, 20 minutes from Puerto Natales or at Punta Arenas airport. Transfer to Puerto Natales, a three-hour drive across the Patagonian pampas. 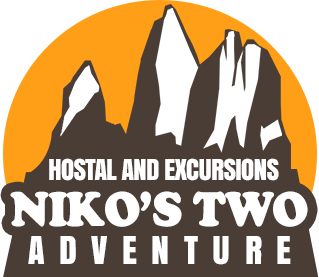 Stay at Puerto Natales in Hostel Nikos II, dinner, presentation and meeting to discuss the travel programme. Maximum 3 hours by bus. Day 2 Transfer by bus to Torres del Paine National Park. This two-hour journey across stays or ranches in the region, with a stop in the village, Cerro Castillo, we continue to travel across the Patagonian pampas and its beautiful scenery until you see the first panoramic view of it, Paine Cordillera And all its mountains. Arriving in Torres Del Paine. Ascend for about one hour to pause and observe the first view of the valley Asencio surrounded by incredible lengas forests, glaciers and waterfalls to continue rising by a huge terminal moraine reaching a lookout. We will be surrounded by 3 giant granite towers (2850 meters), and a pond from erosion caused by ice. You will enjoy a lunch whit this incredible scene and then begin our descent, on the same path until the shelter Towers. Stay at refuge, dinner and breakfast. Hike 8 hours, 18 KM. Day 3 Breakfast. Walk along Lake Nordenskjold and his intense green color of its waters, we will see a lot of flora and fauna, we continued walking, below the hanging glaciers of Mount Almirante Nieto, at the base of The Horns, and we arrived at our accommodation, The Horns refuge. Stay at refuge, dinner and breakfast. Day 4 Walk to French Valley. This valley, the most beautiful in the park and one of the most unique in the world, is surrounded by hanging glaciers and an amphitheater of granite walls and needles. You will enjoy a lunch whit this incredible scene and then begin our descent. Then we will walk along the shores of Lake Pehoe and turquoise, to our accommodation Paine Grande Lodge. Stay at Refuge, dinner and breakfast. Hike 8 hours, 24 KM. Day 5 Walk along the enchanting Lake Grey, with magnificent views of Grey Glacier and floating icebergs. Visiting the Glacier Lake and viewpoint of the same name views of vibrant-blue icebergs. Free afternoon to relax. At night, we will meet to enjoy a toast to have completed the famous circuit W. Stay at Refuge, dinner and breakfast. Hike 4 hours, 11 KM. Day 6 after breakfast, we head to the port to take the Gray III boat at 12:30 a.m., to enjoy a 2-hour navigation in this magical lake surrounded by large ice and the imposing Grey Glacier. Finally we will arrive at the port of the hotel Grey where our private bus will take us to Puerto Natales. Accommodation Hostel Nikos II or the hotel of your choice, dinner and breakfast. Day 7 Transfer to the bus station or airport of Puerto Natales. Services included: airport transfer-Puerto Natales-Torres del Paine-Puerto Natales-airport or bus terminal, bilingual guide, 2 night in Hostel Nikos II, sailing in bout Grey III, 4 nights in Refuge, 6 breakfasts, 6 dinners, 5 box lunch. Not included: Entrance to Torres del Paine National Park, medical and life insurance, tips, beverages, optional excursions, Airline Air or airport taxes, services not detailed in the program.